from Abed's chard in "American Poulty" and full of referents to other texts and previous episodes of Community. 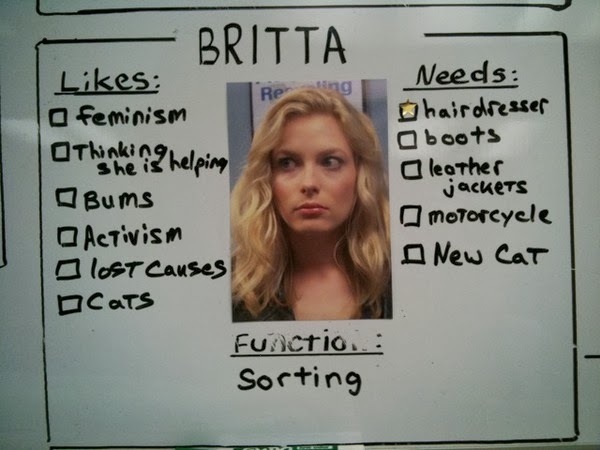 One of the cruxes for the comedy in Community (or at least in the episodes we viewed in class: (Contemporary American Poultry and Epidemiology) is the use of intertextuality (awareness of other texts) and self-reflexivity (awareness of its own text-ness), both of which combine to create a “reality” inside of the show, that is thousands of steps removed from lived reality. When I re-viewed parts of the “Epidemiology Episode,” I noticed a comment from a viewer claiming that the characters’ brushing off their zombie wounds after their memories of the zombie-like incident had been “erased” was “unrealistic.” Which is interesting, because while there is a long-standing IMR-ish rule that action doesn’t have to be realistic to the real-world’s standards to be believable, but that there does have to be some established scope of reality, with limits, for a viewer to find characters well-motivated and “believable.” To this viewer, then, the zombie incident upon which this episode was based was within that diegesis, but the characters’ complicit response to the government cover-up was not. The construction of such a world as that of Community, is a multi-faceted illustration of Baudrillard’s “Similacrum.” The diegetic world of Community is a farcical copy of the diegetic world of the texts it references (In the case of the Poultry episode it was Goodfellas and mobster films, where the Epidemiology episode was framed around every sort of Zombie movie.) These films being referenced are themselves several steps removed from any semblance of reality as well. And so the obvious non-reality of Community serves to make it almost seem as though the diegesis of a movie like Goodfellas is somehow more “real” when that film is arguably equally distanced from reality, just less self-reflexive about it’s distance. Thus in the repeated references to other texts, or to Community itself as a text, function as both a simulacrum and as a turnstile of myth. 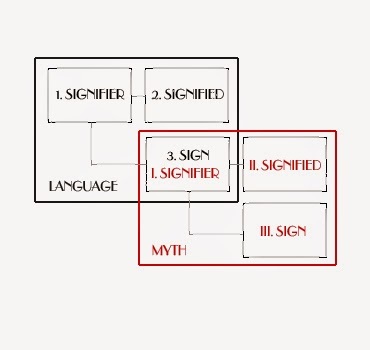 A viewer’s ability to notice and derive a mythological sign or meaning from each of them, allows the viewer to engage with the text on varying levels at each encounter. So, for example in the , Poultry episode, when Abed sends everyone a message, it is still funny and still works for a viewer who is not familiar with Goodfellas, but a viewer familiar with the referenced text may catch the “Layla” theme from that film playing and have their observation confirmed, which, for the purposes of the myth at hand, reduces the entirety of the Goodfellas text to a single “signified language” sign functioning as a signifier in Community’s Mythical sign. Ultimately, the degree of self-reflexivity in the show allows it great leeway with its diegetic world, as the plot of the Epidemiology episode illustrates. But that tremendous space for lateral play also serves to make other constructed “realities”, especially those that are being overtly and implicitly referenced seem far more “real” than they actually are, when all fictional worlds are completely constructed. Baudrillard, Jean. The Precession of Simulacra. 1981. Trans. Paul Foss and Paul Patton.The Norton Anthology of Theory and Criticism. New York: Norton, 2001. 1556-566. Print. Barthes, Roland, and Annette Lavers. "Myth Today." Mythologies. New York: Hill and Wang, 1972. 1-11. Print.